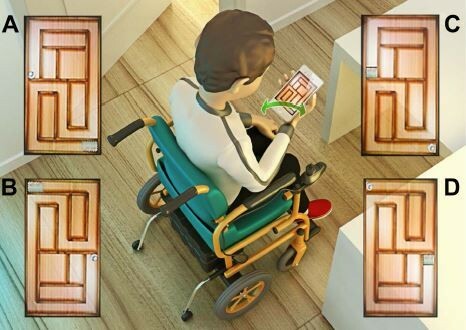 Background: In individuals severely affected with Duchenne muscular dystrophy (DMD), virtual reality has recently been used as a tool to enhance community interaction. Smartphones offer the exciting potential to improve communication, access, and participation, and present the unique opportunity to directly deliver functionality to people with disabilities. Objective: To verify whether individuals with DMD improve their motor performance when undertaking a visual motor task using a smartphone game. Patients and methods: Fifty individuals with DMD and 50 healthy, typically developing (TD) controls, aged 10–34 years participated in the study. The functional characterization of the sample was determined through Vignos, Egen Klassifikation, and the Motor Function Measure scales. To complete the task, individuals moved a virtual ball around a virtual maze and the time in seconds was measured after every attempt in order to analyze improvement of performance after the practice trials. Motor performance (time to finish each maze) was measured in phases of acquisition, short-term retention, and transfer. Results: Use of the smartphone maze game promoted improvement in performance during acquisition in both groups, which remained in the retention phase. At the transfer phases, with alternative maze tasks, the performance in DMD group was similar to the performance of TD group, with the exception of the transfer to the contralateral hand (nondominant). However, the group with DMD demonstrated longer movement time at all stages of learning, compared with the TD group. Conclusion: The practice of a visual motor task delivered via smartphone game promoted an improvement in performance with similar patterns of learning in both groups. Performance can be influenced by task difficulty, and for people with DMD, motor deficits are responsible for the lower speed of execution. This study indicates that individuals with DMD showed improved performance in a short-term motor learning protocol using a smartphone. We advocate that this technology could be used to promote function in this population.